Description: Freiberg in Saxony is an exceptional city as there are four (!) extant Silbermann's organs. The most famous instrument is the three manual organ in the cathedral. It is a work of Silbermann's youth: he built it when he was 27 years old. The sample set, which we present here, is a model of another Silbermann's opus. It is the organ in the Petrikirche (St. Peter’s church), a two manual organ with an unusually rich specification of 32 stops. Admittedly less famous than the Cathedral organ nearby, especially now after the reconstruction, the organ is a representation of the mature Silbermann’s craftsmanship of the late Baroque and an acoustic ideal for many interprets and organ lovers. We take the opportunity to highlight several moments in the history of this instrument. Silbermann’s fame was elevated after he finished the organ for Freiberg’s cathedral. There was no scarcity for new commissions and his works were highly appraised and paid. He settled in Freiberg and not surprisingly, the city councilors approached him to build the new organ for the reconstructed St. Peter’s Church. Silbermann himself expected this order as we can glean from the diary of his nephew, Johann Andreas. According to him, during the fire of St. Peter’s Church in 1728, Silbermann had three finished organs stored in a nearby house and he observed him kneeling in prayer. Silbermann reportedly promised to God that if the house and the organs within were saved, he would build a new organ for St. Peter’s Church free of charge. In any case, the contract was signed on August 3rd 1734 with the planned finishing date in July 1736. We do not have the original version of the contract, only its copy from 1737. The price was set at 3250 tolars, released in 6 payments. It was the duty of Silbermann’s cousin, Johann George, to take over the construction in case Silbermann would die. The original disposition was for 31 voices, but Silbermann, as a gesture of gratitude to the city, added one register for free. Also, his collaborators were chosen among local tradesmen and they are named in the contract. Interestingly, at the same time, Silbermann worked on a three manual organ for the Frauenkirche in Dresden to be finished in November 1735. 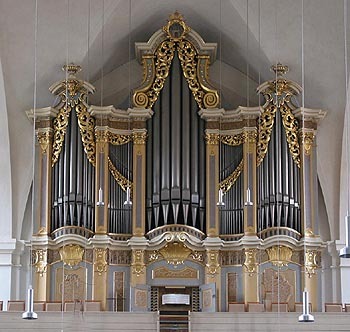 Due to the fact that construction in Frauenkirche was delayed and Silbermann was waiting with an already finished organ for installation, he was able to finish his Freiberg work nine months earlier. Hence both instruments were built mostly in parallel with the same wind chest, disposition, and pipe work of the „Hauptwerk“. This allows us to envision the acoustic performance of the Dresden organ, which was later frequently rebuilt before it was destroyed in 1945. Similarly, lost in time, the destroyed three manual organ in Zittau (1741) had an identical disposition of Hauptwerk. As to the outward appearance of the casework, built by Christian Polycarp Butzäus, it was almost identical with the also destroyed organ in Sophienkirche in Dresden. The St. Peter’s Church organ was consecrated in celebration on October 31st, 1735. Interesting features are many 16‘ voices, „French“ register Vox Humana, a pedal coupler on the principle of "Bass Ventil" (valve), conservative modified meantone temperament and general tuning using "Chortone" a1= 463 Hz instead of a usual "Kammertone", where a1= 412 Hz.